Single ticket to spend the day on the River Thames dining in style as you are treated to a luxury dining experience on the Capital City's River Thames. Cruise down the Thames in style, seeing all the sights, relaxing in a beautiful boat and enjoying a delicious 2 course lunch! This cruise is unique as it combines seeing London's best sights by boat, including The London Eye, Tate Modern, Shakespeare's Globe, Tower of London and Tower Bridge with a sumptuous 2 course luncheon, all cooked and prepared on board. You'll sail down the Thames, enjoying the quality food and the professional service. The menu is Classic British food - a wine list is available on board but no wine is included in this package. This cruise is ideal for both business lunches and those wishing to relax with friends and family. Either way, the service is impeccable, the sights magnificent and the food fantastic - perfect. 1st April - 31st March 2019: Every Sunday. 1st April - 22nd December: Wednesday - Saturday. 5th June - 25th September: Tuesday - Saturday. 24th December 2018 - March 2019: Thursday - Saturday. The lunch cruise will not operate from the 24th December - 26th December 2018. Children under the age of 3 are not permitted on board. A vegetarian menu is provided but for any other dietary requirements, please inform the staff upon booking. You must arrive promptly at the times quoted as any latecomers will miss the boat as the times are scheduled. The cruise lasts approximately 1 1/2 hours. The cruise boards at 11:30am to set sail at 12pm and will return at 1:30pm. Please arrive around 11am to collect your boarding pass. Participants: The Thames Lunch Cruise for One is for 1 participant. Spectators are not permitted due to the nature of the experience - Another ticket would be required. Only in extreme fog will this cruise be cancelled. Every time I go to London I get this overwhelming urge to visit as many of the tourist attractions as possible, but it doesn’t matter how prepared I am (and I always wear my comfiest shoes, that’s a number one rule when wandering around the city of London) I am always defeated. By the end of the day my feet are screaming at me to give them a break and sit down. 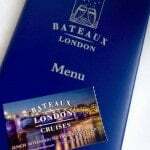 So today that’s exactly what l decided to do as I set sail on an hour and a half luncheon sightseeing cruise, down the river Thames, courtesy of Bateaux London Cruises. The cruise gave me the chance to escape the hustle and bustle of London, and see some of the city’s most famous sights, whilst also enjoying a delicious three course meal freshly prepared on board. In my opinion there is no better way to see London than by boat, as the sights from the water are spectacular and you don’t have to worry about trying to navigate your way round the tube stations. The cruise set sail promptly from Victoria Embankment Pier, where myself and Poppy were greeted by a very friendly waitress and shown to our seats. The best feature of The Harmony boat was its panoramic windows which enabled you to enjoy all the major sights whilst offering a unique perspective of this amazing city. There was also on board commentary during the cruise highlighting the key attractions as we sailed past them and informing us all about the rich history of London. The cruise offers a set three course lunch menu of classic British dishes, an excellent idea if you are a proper tourist (unlike myself) and looking to try some of the local cuisine. They also offer a vegetarian alternative to cater to everyone’s needs. Once everyone was seated on board and we had set sail it was not long until our first course arrived…and I was in for a treat. Even the presentation made my mouth water so you can imagine how good it tasted. 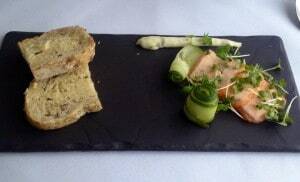 To start I had smoked salmon terrin, accompanied with pickled cucumber, caper mayonnaise and buttered whole grain bread. 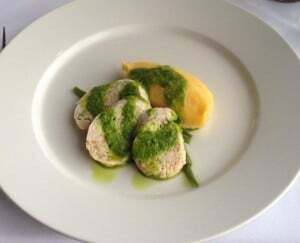 This was followed by my main course; chicken ballotine, sweet potato mash and a French bean and rocket pesto, which was delicious. And of course no set menu would be complete without dessert (my favourite part of the meal!) 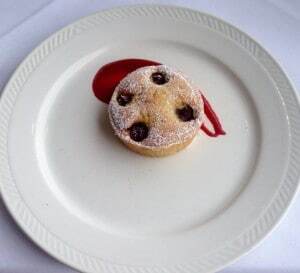 and the cherry frangipane tart with cherry and raspberry coulis did not disappoint! 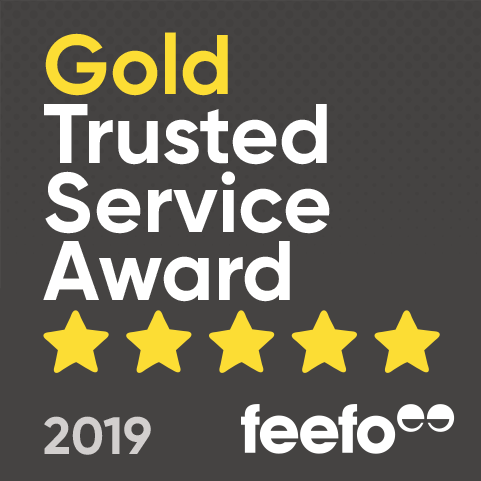 Not only was the food amazing the service was also impeccable; the staff were attentive to our needs and very friendly making our experience thoroughly enjoyable. After my meal I decided to get snap happy with my camera ( I love acting like a tourist).The views from the boat are wonderful, as you get to absorb the beauty of London and the juxtaposition of the calm tranquil cruise compared to the flurry of the city centre. The ship also boasts the largest open viewing deck on the Thames; unfortunately it was raining whilst we were on the cruise and I didn’t fancy getting wet, but I would definitely recommend checking this out on a sunny day! The cruise really is one of the best ways to experience as much of London as possible in a short space of time; In the space of an hour and a half we managed to see the London Eye, Tower Bridge, The Tower of London and the Tate Modern, to name but a few of the 24 landmarks you will pass by.